Leaving Durrës I thought I’d selected a good route that would take us to the camping place in the suburb just south of Tirana centre, without us having to tackle the city’s notorious traffic on a Friday afternoon, and without taking the motorway. Signs are not a priority in Albania, but after a few false starts and stopping to ask where on earth we were, we somehow found ourselves on the right road. Most of it was a country route through undulating rural areas. 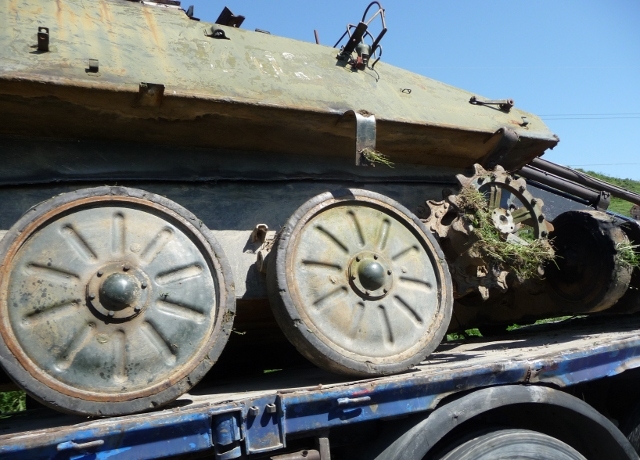 The highlight was spotting some ancient remains of tanks that had just been pulled out of a field on a lorry. The one last turning we had to take to avoid the city somehow vanished and before we knew it we were in central Tirana driving along a main boulevard with a river running down its centre with grassy banks rising up to the meet the thoroughfare on each side. The traffic was busy and typically erratic, but we counted turnings and managed to find the right route out again. Our campsite was at Hotel Baron in Sauk. On first sight it looked closed and rather down at heel, but we pulled into the garage forecourt just in front of it to find out what the score was, we’d already phoned ahead to check it still existed. The young attendants were only to happy to help – the main entrance to the hotel was on the other side of the garage, but a bit of the road just in front of the driveway was being resurfaced. We could walk through and leave the van there. Our first impressions were thankfully overridden as we were greeted by very friendly staff, a much nicer looking hotel on closer inspection with an out of the way car park where we would camp, and a key to our own bathroom in the hotel. And why not have a drink on the terrace overlooking the edge of rolling countryside at the rear of the hotel, while we waited for the resurfacing to finish? Luckily by the time we had drunk our beers, the tarmac was done. We were lucky, this was around 4pm and a car had still been waiting to drive out after lunch at the hotel restaurant. We settled in quickly and caught the bus into the city, a mere 3km away and a grand total of 60 lek for two of us – that’s about 35p – not each, but for two! 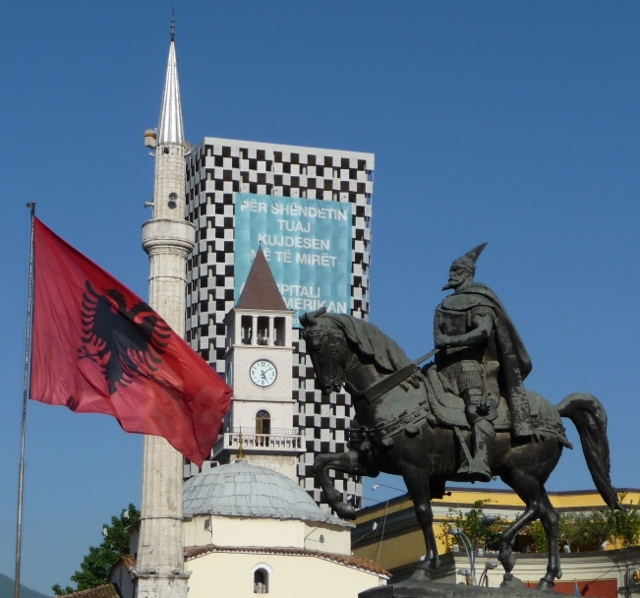 It took us close to Skanderbeg Square – the main focal point of the city, with a beautiful painted mosque on one corner – probably one of the older buildings still left in Tirana. It is the one city we’ve been to that has barely any old bits. We followed a short walking tour from our guidebook to help get our bearings as the evening light hit the large Communist era buildings and the statue of national hero Skanderbeg himself astride his horse in the centre of the square. It was a large expanse with wide avenues leading into it – plenty of space for all those military might parades of the past. The square is also home to the National Historical Museum with its socialist realist mosaic of the proud partisans. The Albanian flag has been ‘corrected’ now, the star above the two-headed eagle has been removed. We also strolled down to the old Tanners Bridge, and looked at the colourful apartment blocks on the other side of the boulevard we’d driven in on. 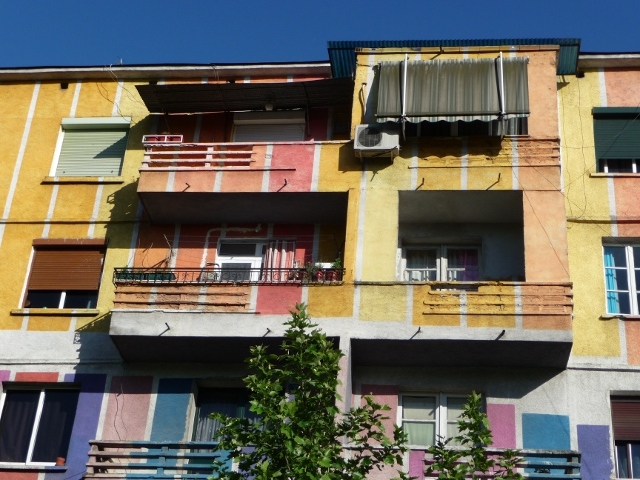 A mayor in the early 2000s was an artist and decided to brighten the city up by using colour on a lot of the dull apartment buildings. They’ve faded a bit now, but they still liven things up. After a beer at a bar in a restored old house, we went in search of dinner. We inadvertently stumbled onto the trendy quarter, known as Bllocku, formerly a Party elite area where ordinary Albanians weren’t allowed to go. They are making up for it now though. It is a few streets full of hip bars and cafés, their plush seating areas crowding the pavements, flash cars cruising up and down (many big 4x4s on GB plates…) and the young Tiranians dressed up to the nines out drinking. Drinking what mainly appeared to be coffees and soft drinks, a few beers and possibly some rakis, but mainly non-alcoholic. Not eating. No food being consumed as far as we could see anywhere. Albanians still don’t tend to eat out very often and we turned to our guidebook for suggestions. Several of the tempting-sounding restaurants seemed to have disappeared, but we managed to find one, Era, and tucked into some wonderfully filling Albanian specialities. We love the food here, but there just aren’t enough Western European foody tourists coming to Tirana to support the few restaurants there are, and those that do come are all too often in tour groups who tend to eat in their hotel restaurants. Era was quite busy though, and incredibly good value. Unlike most captial cities the prices are not higher here than we’ve found in the rest of the country. On Saturday morning we went to the National Art Gallery. There was an exhibition of Ibrahim Kodra’s work, a contemporary of Picasso with his own take on Cubism. What we’d really come to see though, was the collection of Socialist Realist works. These propaganda depictions of happy workers flexing their rippling muscles, gaily wielding their hammers and sickles in victorious stances with such joyous titles as ‘We are at the forefront’ and ‘Lift the revolutionary spirit high’. Women workers were portrayed alongside men, with backdrops of foundries, hydro-electric plants and tractor factories. Also there were works on display that didn’t pass muster and were black listed by the Party for not conveying a positive enough message, and the story of one artist who had a whole studio of bronze female nudes destroyed because they apparently showed foreign influence. In Tirana, more than anywhere else in Albania, one is reminded most strongly of the Communist Era, and after a lovely lunch at a small backstreet locals’ eatery, we passed below the famous mosaic facade and entered the National Historical Museum. This huge building houses exhibits showing Albania’s history from pre-historic times almost to the present day. It has a hall of fabulous icons, many from churches we’ve visited around the country. It also covers the Communist time with poignant reminders in everyday belongings of those imprisoned, tortured and often executed during those years, usually without any trial, for transgressing the Party line. Very little of the text was translated, but the harrowing pictures of firing squad shot corpses and exhibits of blood stained clothing didn’t need so many words to get their meaning across. There was a grim reconstruction of a prison cell, and a display of instruments of torture. We imagine that Tirana has changed an incredible amount in the last twenty years, and it looks set to continue to do so at a fast pace. It has a vibrant feel, an unexpected amount of green spaces and use of colour in public areas. It aspires to be a player on the European stage and one day that is sure to happen – definitely an up and coming place. We did a lot of wandering, augmented by stops at bars and cafés for refuelling and checking out of landmarks, such as the rather dilapidated pyramid, once a museum of Enver Hoxha’s life, designed by his daughter and son-in-law, and a leafy flash part of town full of embassies, and upmarket shops and bars. We ate out at an outdoor restaurant before following the coloured light walkway past the unfinished American Hospital skyscraper to the bus station. Looking out for our bus amongst the second hand buses presumably bought cheaply from a French city and still showing the French advertising and destinations, on the front these are covered with pieces of paper showing the Tirana destinations but are not lit up. Sunday morning found us breaking into the grand but closed Martyrs’ Cemetery. It seemed to be the accepted method judging by the bent railings and the fact that a perfectly respectable Albanian lady and her Canadian companion came out that way and gave us directions. 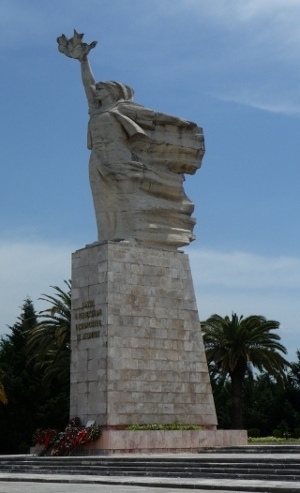 Set on a hill overlooking the city it is the statue Mother Albania that presides dramatically over the tombs of fallen Partisans, including 19 year old Margarita Tutulani – still very much remembered judging by the flowers on her grave, and other notable citizens. The tomb of former dictator Enver Hoxha has been removed and his body buried elsewhere. After navigating our way out of the city via Skanderbeg Square, we headed for Kruja about 40 minutes’ drive north. This entry was posted in Art & Culture stuff, By Country - Albania, Travel stuff. Bookmark the permalink.